“Hurry up you turtles!” Wael yelled in the distance. He had suddenly turned this walk into some kind of contest. We skipped across the rocky landscape of Palestine, dirty and with the sun in our eyes. 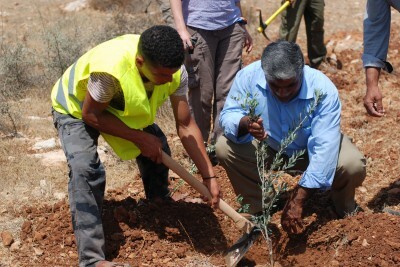 We were planting trees in the small village of Aqraba, putting up pictures of our missed friends Rachel Corrie and Vittario Arrigoni. Men and women, young and old were helping out with the planting, and we were treated to tea sweet as syrup. 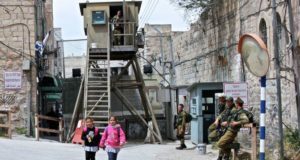 Aqaba has lost 144,000 dunums of land to the ten illegal settlements surrounding the village. 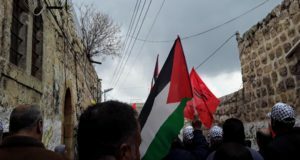 A road is being built between the settlements of Itamar and Gittit, effectively grabbing even more of the 17,000 dunums still in the villages possession. After the planting some villagers insisted on showing us something on the other side of the mountain adjacent to the hillside on which we were planting the trees. We went down the slope between the blooming red, yellow, and purple flowers. We crossed the road leading from Itamar to Gittit and started climbing around the hill on the other side. From a rock right next to the trail a turtle watched us wobble past a hyenas nest with our arms stretched out to our sides, so as not to lose our balance. On the other side of the hill, was a cave used by sheepherders as a place to sleep for hundreds of years. A few steps further down the road I got to see my first blooming almond tree of the year. Beyond that, the lemon groves stretched across the floor of the valley. We were given lemons and oranges by the farmers and their children. I used the few Arabic phrases I knew to express my gratitude. 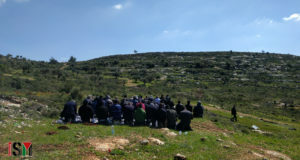 Then we started the journey back to the olive trees. We picked up speed, not even stopping to admire the stunning view of the rolling green hills of the West Bank. Wael picked up the pace, treading with experienced feet over the rocky ground. As a worn-out tourist and skeptic, who has long given up the search for the genuine and untouched, I find myself in this setting, my hands sticky with the sour juice of fresh lemons. The sheep grazing the mountainside stare at me just like the turtle, the street vendors of the old city of Nablus, and the children of Balata. As a Westerner I stand out here, without ever feeling like an outsider. The stare of the turtle, the sheep, the vendors, the children are all full of anticipation and curiosity, as is mine when I round the steep mountainside to catch up with Wael. “Hurry up you turtles!” he yells in the distance. But I find no reason to hurry. Palestine has greeted me well. Jonas Weber is a volunteer with International Solidarity Movement (name has been changed).